Lets start with Silverstone was HOT!!! Now that's clear lets move on!. Another awesome show, where we were joined by some great customers with their beautiful cars. Chris brought along his menacing black Dual Concave Velgen Split 5 beast, running full Steeda under carriage as well as some Anderson Composite goodies and Corsa exhaust. The Steeda Mondeo Sport was brought along by the Williams's and looked as great as ever (Ah the memories! What a GREAT car! ), which showed off the 20" OZ Racing Leggera HLTs, Paul brought along his Velgen Classic 5 equipped Focus RS in his Gulf homage livery which looked cracking and features a Milltek exhaust system as well as a variety of other choice parts, the Steeda Q500, fresh from its round of amazing reviews was showing it's stuff and Motorsport and Performance also showed their cracking demo car, also wearing Velgen vmb5s in bronze and of course with a comprehensive array of Steeda parts making it drive as good as it looked. 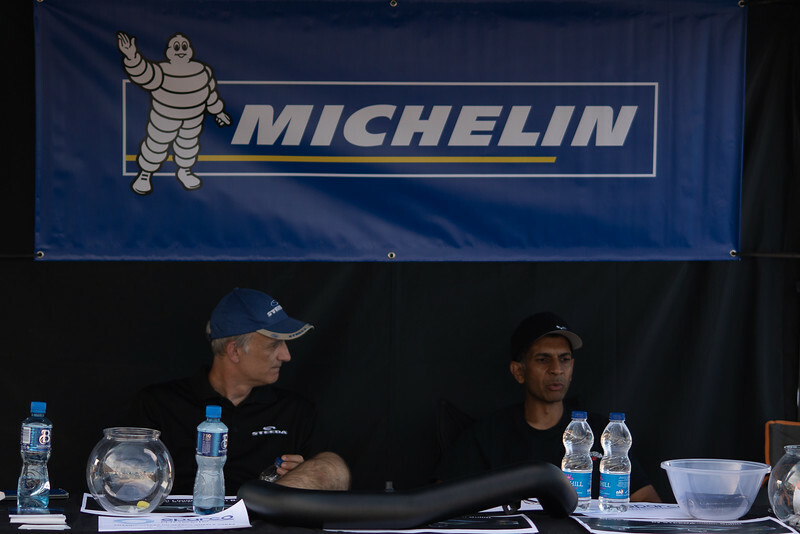 We welcomed many of our great customers on stand during the day and were also joined by the team from Hendy Performance, the guys from HP Tuners, Jamie, the Editor of Fast Ford and many more as well as Shannon who was a great helping keep things going! 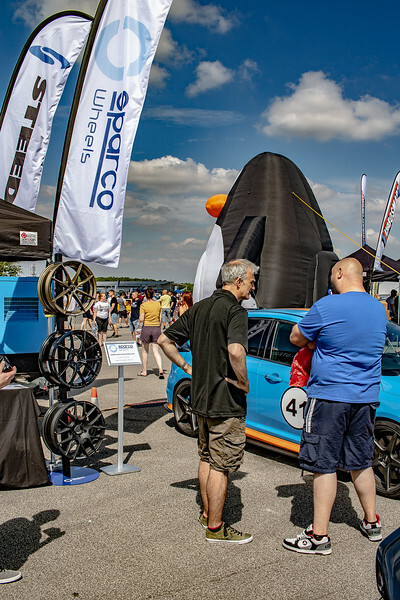 The stand featured a display of Velgen wheels, and also Sparco wheels, which are the perfect choice for the Fiesta and Focus owner looking to step up their style and performance game! Don't forget to match those wheels with great tures from our partner Michelin Tyres. 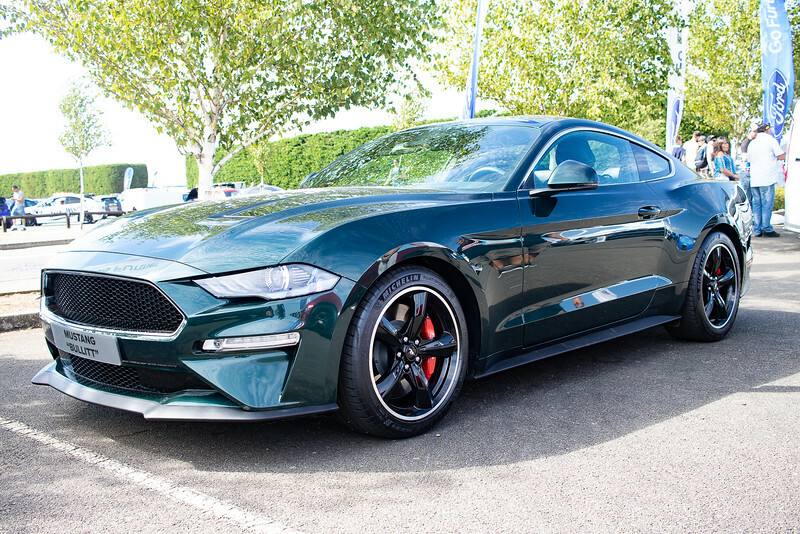 Ford showed off the new Bullitt Mustang on its stand, which also involved a contraption allowing people to throw themselves off a cliff? Perhaps Ford was preparing people for Brexit? More importantly Ford were also kind enough to lend us their supercharged demo Mustang, which took pride of place int eh centre of the stand. 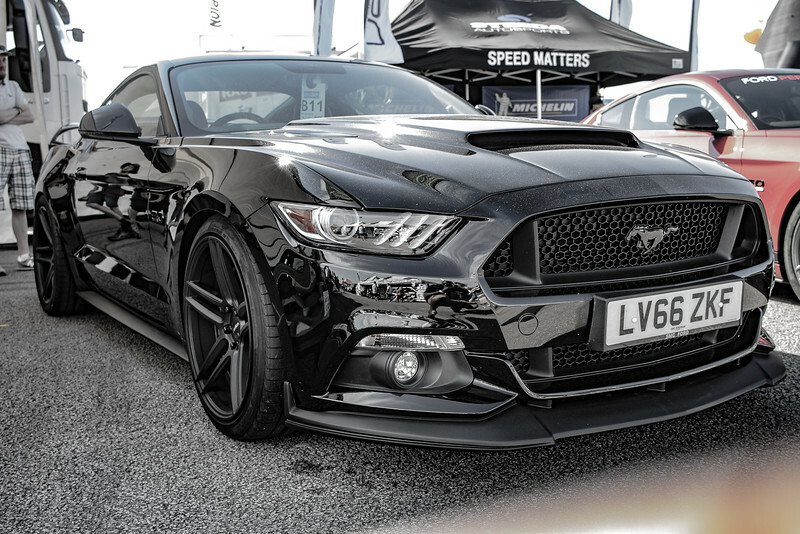 Their GT is also equipped with Velgen 20" Split 5s clad in Michelins of course as well as some choice Steeda mods on the IRS and a full pack of Ford Performance upgrades. Unfortunately we had to give it back to them at the end of the day,as the car is frankly gorgeous! Check out the vid we made with her on one of our Steeda Driving Days! Steeda Robbie & John sit down and try to work out how to ration the remaining water....... Before panic ensues! 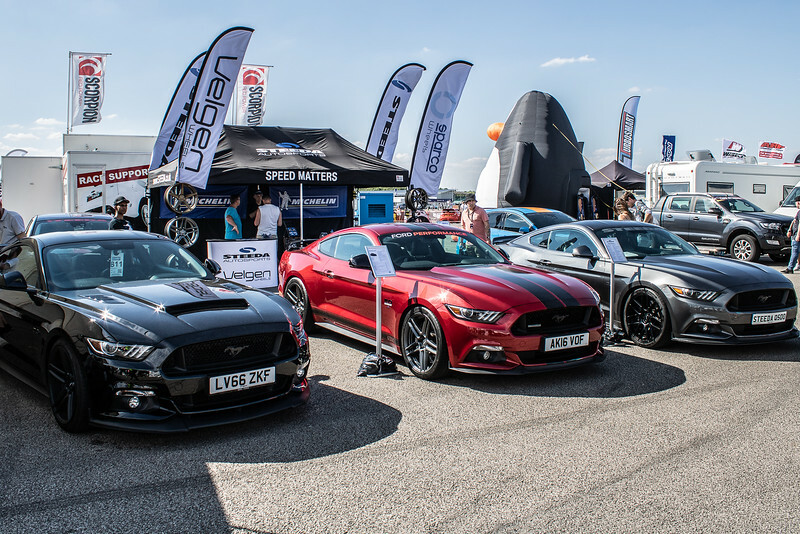 As you may have seem from our various other blog posts the Mustang has a long and storied history on the drag strip a well as the race track, a legend that continues today, with the Steeda Silver Bullet setting World Records regularly, as a 2018 model 10 speed auto with NO forced induction, and here in Europe, with 2 Steeda customers, Richard and Owen taking TWO of the top four positions at Santa Pods' Run What Ya Bring Championship, including the win. Here is a feature on Owen's car, which looks fairly standard from the outside, but regularly puts the smackdown on unsuspecting rivals at Santa Pod! Owens weapon of choice is a 2017 5.0 GT, with power duties being generated by a Roush 2.3 litre supercharger with 80 mm pulley, phase 2 kit with 1000cc injectors, and uprated fuel pump. Dyno day saw a nice 800 bhp at the flywheel translating to about 700rwhp. with 856nm torque twisting the wheels. to help add some more spice he has fitted a Wizards of Nos fully programmable nitrous system for upto around 250 bhp of extra go, only used around 60/70% of that in 3rd/4th and as little as 25% in 1st/2nd gears. Anything else is secret and the mapping for the nitrous delivery was done personally by Owen and has taken around 50 odd passes to get right. To put down that power through the tyres he has chosen to use a full Steeda "Stop the Hop" kit including sub frame alignment braces. Standard 19” wheels with Mickey Thompson 185/35 street ss/et radials for the strip, Michelin pilot sport 4s for street use. Owen told us that once he added the Stop the Hop pack he noticed a radical improvement in how the car behaved pulling away from the line. Other suspension mods include Eibach anti roll bars front and back, Ford Performance suspension all round. Remember that this car is a full weight factory interior car that’s driven every day in all weather and traffic conditions that has done 26,000 miles in 16 months without ever missing a beat and has no more maintenance than fresh oil, filters and regular services every 5,000 miles, she runs on nothing other than either momentum 99 or VPower, I use an octane booster for safe running with the nitrous when racing and that’s it. I guarantee she’ll run under 10.5 seconds in 2019 and with 60 ft times of 1.6 seconds I’m guessing at 0-60 of well under 3 secs. Go Owen! Owen's car may be somewhat of a sleeper but his racing stripes and custom rear deck, plus nice personal plate make sure that once you recognise it,you'll know that's one bad pony! Good luck in the 2019 season Owen! We know that the 2018 Champion, David Kinghorn in another Steeda equipped Mustang will be back to try and defend his title too. Let's hope we can secure BOTH the top 2 positions next year! Or if anyone else wants to join the fun, perhaps an all Steeda Mustang podium can be achieved? Who wants to step up to the job? And if you want to learn how to generate smoke as effectively as Own then perhaps take a look at our Line Lock Academy video below! 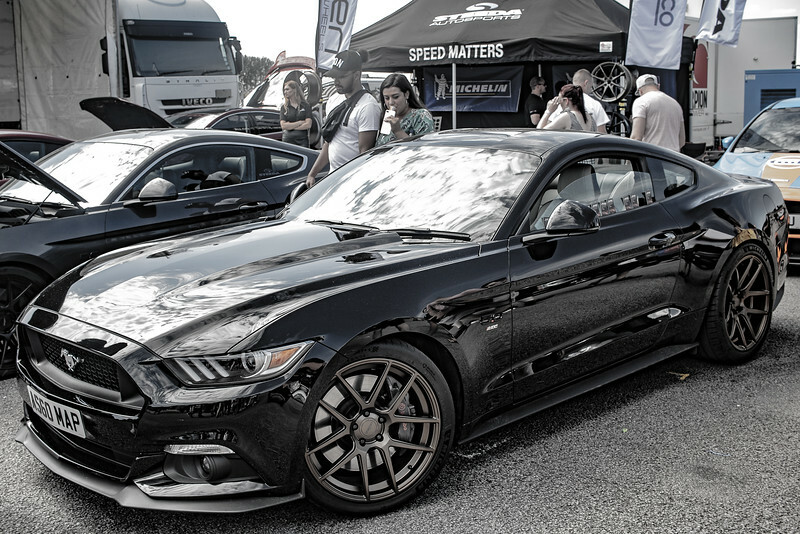 Did you know that Line Lock is a built in feature of the S550 Mustang allowing controlled burnouts with ease? 2018 Race Round up - Speed Matters! As Steeda celebrate our 30th anniversary, we also celebrate another great year of proving that "The Steeda Difference" matters on track. It's where we earned our great reputation for performance and quality and its not something we rest on our laurels about. Steeda keep on developing and keep on testing our theories on track. As Dario Orlando says, "The race track is a great place to prove your theories, as results do not lie!" Not only that but life on track is TOUGH, and its the fact that Steeda parts are built for the rigours of track life that allow us to offer our unrivalled LIFETIME warranty on so many parts. Just one of many benefits that goes straight from the track to benefit you, our great customers. 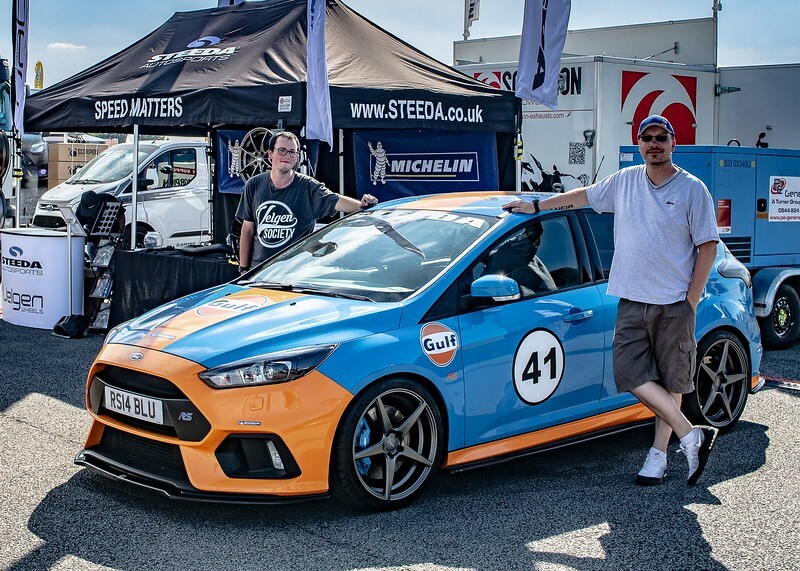 2018 was another great year for Steeda both on the road racing circuits AND on the drag strips and that winning pedigree has begun to spread into Europe with Steeda making our mark over here as well. Famous US based tuner Lund chose Steeda for their more extreme 2018 drag build and with Steeda traction too it to an amazing record grabbing 7.78 @ 177mph! In the UK, Matt Binstead has been crushing the Clubman class in Time Attack 2018 in his Steeda sponsored Fiesta. 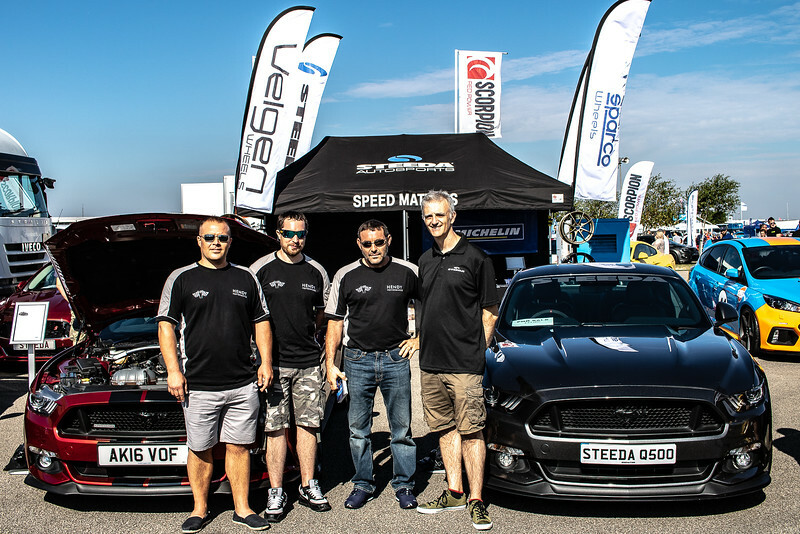 On the Drag Strip at Santa Pod, Europe's home of drag racing, the RWYB Championship was won by David Kinghorn in a S550 GT with Steeda Stop The Hop package for traction plus a Steeda Race Shifter to make sure he never missed a gear! David was chased onto the top step by Owen Waddingham ANOTHER Steeda customer with a Stop The Hop equipped Mustang GT, who finished a very respectable 4th place. So that's Steeda equipped Mustangs in 2 of the top 4 positions on an OPEN Championship where any car can apply. Great work fellas, go Team! David also proves that fitting Steeda parts doesn't cost money it makes money! Its an investment! (honest). Also please remember. Keep YOUR racing safe, on the track or at the strip but NOT on the road. If you want to start getting a feel for off road driving and seeing what your Fast Ford can do, why not JOIN US on our next STEEDA DRIVING EXPERIENCE ON JUNE 29th. 2019? You can't have more fun in your car and you can meet the Steeda UK team and fellow Steeda fans and compare cars and times.